It all started at Johnson & Wales University when Rand and Chris met. They noticed from their name tags and they were both commuting from Delray Beach to Miami. So they started to carpool; those rides together to Miami were where their friendship really started. After only a few weeks of carpooling Chris and Rand decided to move into Chris’s apartment near Johnson & Wales University. In only a few short months they had become best friends living together in Miami. During culinary school Rand and Chris excelled to the top of their class, becoming the go-to guys to get things done. Every Tuesday, the food trucks would set up on the campus at JWU and serve to all of the students. Chris and Rand became immediately attached to the food trucks, asking all of the owners questions every time they came out. In their heart they knew someday they would open up a food truck of their own. Soon after, Rand was asked to work as a sous chef for a husband of one of his professors. He was a private chef to the rich and famous in Miami. It only took one year before the clients asked Rand to be the head chef, at the age of 22. One of the first things that he did was to make Chris his sous chef. This was a time in their lives that they would never forget. Chris and Rand were living half the year in Miami and the other half in New York City while cooking for the rich and famous. While in New York, Rand and Chris were living on their client’s yacht. Rand really enjoyed living on the yachs, he said, “because it was like a huge house right on the water, that swayed back and forth with the current, just rocking you to sleep”. One year Chris actually rode the boat up for 4 days to New York City, through the rough seas, while still cooking all of the food for the crew. Let’s just say he probably won’t be taking a boat across the country anytime soon! After three years of being private chefs Rand and Chris caught the entrepreneurial bug. They received so much praise for the food, from some of the most important people in the country. They knew they wanted to bring their food to the masses, but they didn’t quite know how to start a business. So Chris and Rand left their jobs as private chefs to head to Chris’ family’s company, Uncle Giuseppe’s, a chain of Italian supermarkets. While at Uncle Giuseppe’s, Rand and Chris were taught the importance of food costs, business smarts, and the ability to scale larger while remaining consistent with the food throughout different locations. So they headed back to Florida to start their own business. The location of the first restaurant caused arguments, as they just weren’t sure where to put it. That was when they thought back to when they were in culinary school and the food trucks would come every Tuesday. Rand and Chris thought very hard about what their next move would be. They decided to start a food truck as a proof of concept and to find the best locations for the eventual restaurants to come. They called it Miami Press Gourmet Sandwiches Food Truck. The concept quickly took off, as the Miami Press Food Truck became one of the top trucks in South Florida. It was a dream for Chris and Rand to be able to serve their great food to the masses. They knew that if they used good fresh and local ingredients and prepared the food to order that they would always have people wanting to eat their food. While the truck was taking off, Rand got the opportunity to go on Food Network and compete in a reality competition cooking show. The show is called Food Truck Face Off, the show is a mix between The Great American Food Truck Race and Chopped. Rand brought one of he and Chris’s signature dishes, the Mac’n Cheese Ball. He won the competition, bringing the spotlight to the Mac n’ Cheese Balls and the already well-known Miami Press Food Truck. The lines became even longer as their food truck became more and more popular by the day. 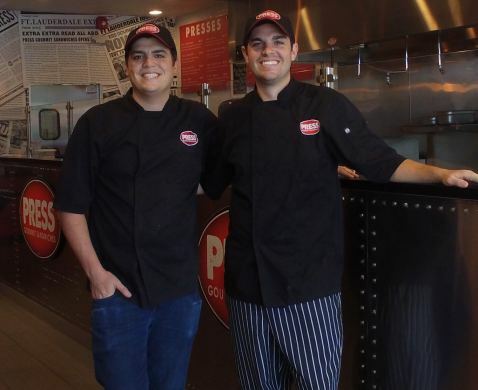 As the success out grew the food truck, Chris and Rand finally knew it was time to open up a Press Gourmet Sandwiches Restaurant. Press Gourmet Sandwiches, or PGS for short, is a fast casual sandwich restaurant serving pressed sandwiches. All of the sandwiches are made to order from scratch and pressed on ciabatta bread until crispy on top and soft in the middle. It’s made with all fresh and local ingredients.